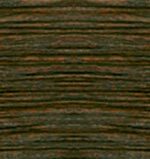 Wyoming-made, unique, practical outdoor gear is what we do. We spend our share of days in the field and are aware of the fact that having the right gear at the right time is critical to outdoor success. We feel that our gear (what we purchase from others as well as what we manufacture) must meet two criteria. It must be practical (meaning it must work darn good) and it must have a price that represents an excellent value. We work hard. You do too. That's why we stand by the statement on the information card that comes with every Day's Worth Fly Box. It says: "At Cliff Outdoors, our aim is to design and manufacture the highest quality, most practical fly fishing accessories without bending you over." Finally, we guarantee that if at any time you are dissatisfied with any product of ours, we'll simply make it right. You have our handshake on it, period. 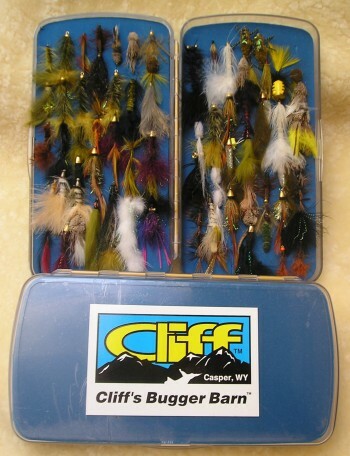 Two new great fly boxes from Cliff Outdoors - The guys over at Cliffs have done it again! Winners of the 2008 American Angler Ka-Ching Award - The Cliff Crab Shack and Super Days Worth Fly Boxes. Both boxes are They are built cowboy-tough right here in Wyoming. Place your orders now because when the shipment arrives in a couple of weeks they'll be sold out! NEW! 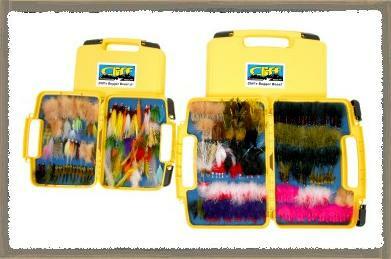 - Cliff Outdoors Crab Shack fly box - Just Added! 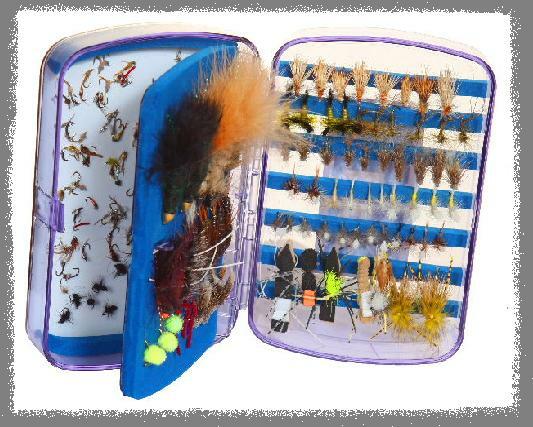 This is the perfect fly box for fishing the flats or backcountry. Got Crabs??? We can put them in their place. 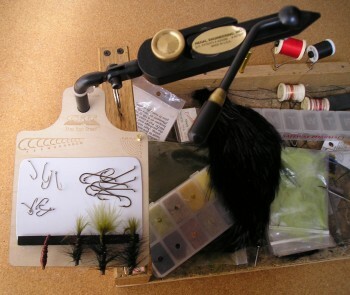 This is the perfect box for spending hours on the flats chasing silver bullets. Just the right size to fit in a fishing shirt pocket, yet has all the capacity that an angler needs. Our slit blue material keeps the crabs where they belong. NEW! 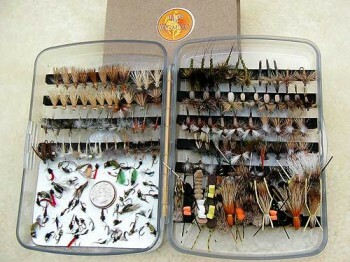 - Cliff Outdoors Super Days Worth fly box - Just Added! Why would you need anything else? This holds them all. Midges, Streamers, Dries, etc... American Angler "KA-CHING" Award Winner for 2008! Midges, Meat, and Mayflies — Oh My! Our triple layer design allows you to effectively hold a ton of different sized flies. The magnetic bottom handles all the small files. The leaf has our time-tested slit blue foam that really grips the big, heavy stuff. The top is set up to hold and protect dozens of dry flies. It will take a beating. Fits easily in a fishing shirt at 6” x 4” x 1 5/8”. There are anglers out there, like us, who like to throw meat (big flies). Big flies catch big fish, but the problem is, "How do you store them?" We have the answer. The Beast Series uses the same time-tested, hook gripping, slotted blue material as our infamous Bugger Barn. 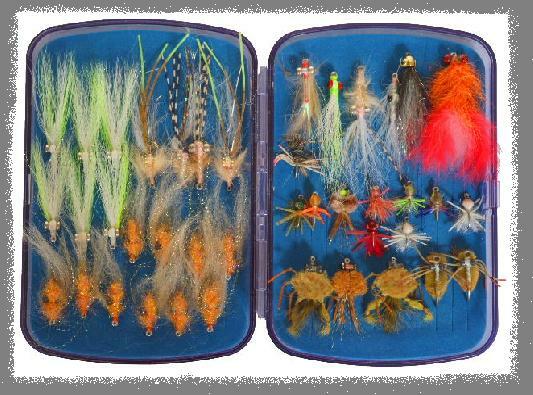 If you are at the stage where you have accumulated and want to organize lots of big flies, we've got the box for you. Cliff's Bugger Beast is 13.5" X 9" X 3". The Beast Jr. is 10" X 6.5" X 2.75". the question is, "How much meat are you going to pack?" American Angler "KA-CHING" Award Winner for 2007! Guide-tested by the Grey Reef Clifftarians, and used exclusively by legendary Bighorn River guide Kip "Snookie" Dean, our Float Patch™ has become a standard on western rivers. Lets face it - while floating in your boat or personal watercraft, you don't want to take the time to dig into your boat bag and put flies away in their proper box. You just want to set them down within reach, in a place (hopefully) where they won't get lost or blow away in the wind. The Float patch adheres to any flat spot on your boat, and in the wind it holds onto your flies like a bulldog. Think were kidding? It's held onto flies while dragging a drift boat at speeds in excess of 90 mph on Wyoming Highway 220. 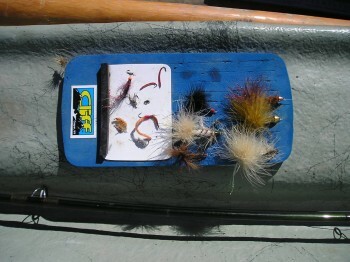 Small flies go on the stout magnet, and larger patterns are held securely in the slots. The Float Patch™ is handy as hell, it works, and you're going to wonder how you got along without it. The name says it all! A unique must have fly tying accessory. Keeps you organized and your tying efficient. Use the hook and hackle gauges to keep the sizes right. Hook sizes from 4 to 24, hackle sizes 4 to 22. The magnetic work surface keeps your hooks handy and out of the mess. To attach to your vise, simply slide the vise shaft into the hole and adjust the height. Slide the o-ring onto the shaft to keep it in place. To remove, reverse the process. NEW! - Brodin Tarpon Stretcher - Just Added! Now that Brodin is located in tarpon country, they thought it appropriate to manufacture a tarpon stretcher. When you go on a tarpon fishing trip, don't expect to find the right flies or leaders. Make sure that you bring them with you. The Brodin tarpon stretcher is designed to hold twelve flies that are attached to leaders and ready to go. That way the shock tippet is stretched and will be straight when you put it on your fly line. Tarpon trips cost a lot of money- travel expenses, lodging, guide fees add up quickly. Your trip will go smoothly if you have the proper flies and have them attached to leaders. Tarpon break off more often than not and having a pre-strung leader/fly combination will get you back in the action quickly. Perfect for storing and drying off streamers & wet flies is the handsome, sheepskin-lined leather wallet, or leather and canvas wallet with zip fastener.